Ah yes, it’s these people! Sorry that things have been a little behind lately. We’re still getting the comics out, just… not on time. But sooner or later I’ll be able to catch up. We appreciate your patience and love you guys a lot! Pure bardic power! It’s strong stuff. Can Skarva swim? You’d think he could. I was partially thinking he’d just jump in and go grab whatever treasure physically. It’s always good to see Skarva as the mighty water-bender he is though. Yeah, he can swim, but not any better than anyone else really. Unless he cheated with magic. He doesn’t actually have gills. Also… if he jumped in he would probably meet his end by a real shark, thus proving indisputably that the gods are smartass jerks. Doesn’t he have an affinity to water or something? Or does he like water temples for some other reason? He likes water temples because they are notoriously frustrating to heroes. He has no special affinity to water as an element. Skærva just got something amazing. Since Havoc’s holiday is HavocFest, does that mean that one of the gods is known as ‘Light’? Would the God of Death then be called… ‘Dark’? So if there’s Light magic, is it more commonly associated with that god? Would Dark Magic be associated with the god of Death then? But then Healing Magic is just out there randomly. Probably not on the magic/god connection then. What kind of Christmas art are you planning this year? Growth and creation. You’re right about your first two sentences! The God of Death is not “Dark” though, and while magic is associated with the gods, it’s not cut and dry, one-god-per-magic-type. Magic typology in general is complicated. Ohh, I dunno! I need to start thinking about that! “bloop” and “splooooosh” …I think those are the best sound effects you’ve used yet. And I just realized something; Is Slice the only competent minion so far? He found the Lii Flower AND a key now…and that awesome keychain. You’re right. He really is the MVP of that team when you think about it. 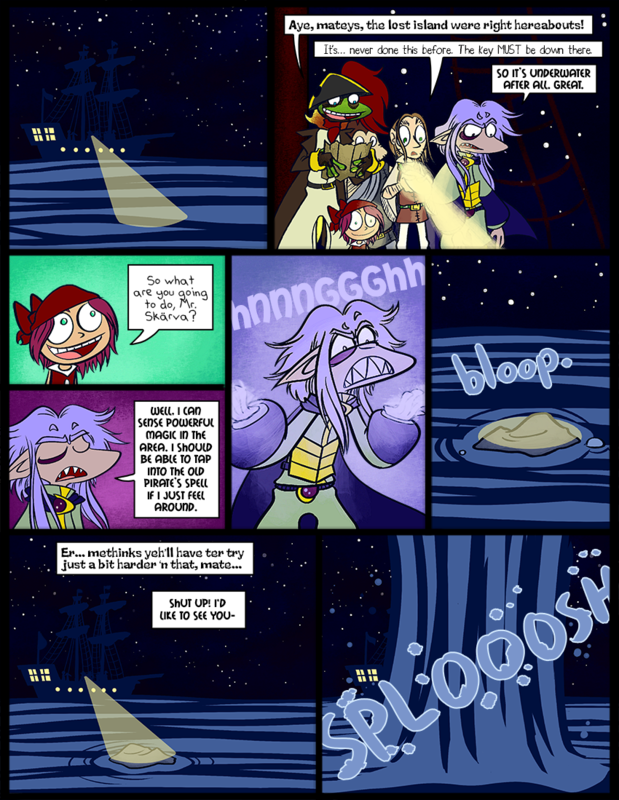 I love how this page looks so far, I second the thought that the starry skies are beautiful. I also wanted to make a comment about skärva raising Atlantis, but I forgot what it was. Thank you! I wish I had more chances to see stars like this. Living in Houston, it doesn’t happen too often. I can always count on the witty dialogue. Oh yeah, if you explore these pages you’ll see just what an eloquent artist of verbiage Skärva really is. That thing is putting out A LOT of light. It’s about a C4 LED, I’d say… Make sure no one looks at that thing straight-on. Bloop is an excellent sound effect. On an unrelated note, I hope you don’t mind me asking this, but what do some of the main characters sound like? It’s OK if you can only tell me a vague idea of what their voices sound like, but I was just wondering. Partially because I sometimes imagine Skarva with a very sarcastic voice. For me, I always imagined Skarva sounds like Jack Spicer from Xhaolin Showdown. Lorelie sounds like Blossom from PPG. And Derk sounds like Ed (but serius) from Ed, Edd, and Eddy. I think Jack sounds too young for Skarvs though. I can see Lorelei/Blossom (and I’m sure there was some kind of subconscious design inspiration there, anyway). Haha, y’know… various people have asked that, and the truth is, I really have no idea. I can’t even nail down voices for them in my own head. I suppose he WOULD have a very sarcastic voice, but I’m not sure what that means as far as its timbre. So we’ll leave that kind of stuff up to you guys’ imagination for now! The best spell incantation in history. But I thought you liked water temples, Skaerva! Looks like they’ve found something, at least.